Hi, my lovely friends! 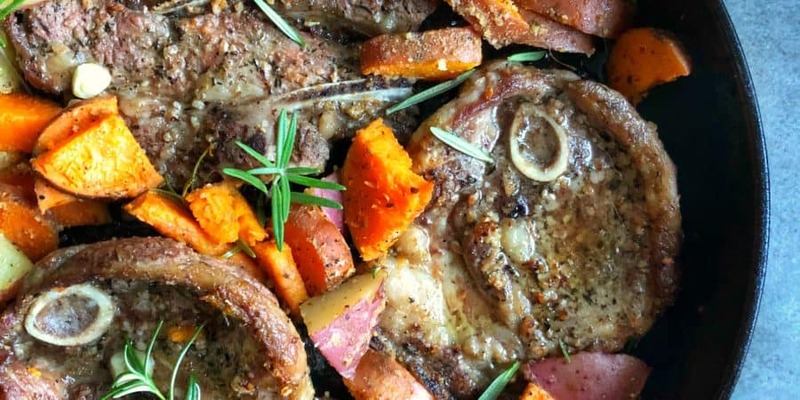 The other night, I made hubby and I this delicious lamb chops and potatoes skillet and I would be lying if I said that I have ever cooked lamb before. I have always been hesitant to cook with it and honestly, I never really liked lamb growing up. It’s a taste I have learned to enjoy in my adult years. When I saw these marinated lamb chops grocery shopping this past weekend, I knew that I had to give them a try! My husband loves lamb and I knew it would be a treat since I NEVER make it. Potatoes and meat are the perfect duo so it was a no-brainer that I added that to my skillet. They absorb flavors so well! Let’s just say we were both very impressed with the outcome of this dish and I knew I had to share it with you guys. *If not already marinated, marinate with your favorite marinade or to your liking. I recommend allspice, S & P, garlic powder, dried oregano. In a small pot, add the potato cubes into boiling water. Cook them till just fork tender. This should take about 8 minutes or so. In the meantime, add the olive oil to the cast iron skillet. Warm up the skillet on medium heat. Once hot, add the marinated lamb chops. Make sure the lamb chops have salt and pepper. You should hear a sizzle. This will ensure a nice sear and crust for the lamb chop. Sear for 2-3 minutes on each side till you get a nice golden brown color. Add the garlic slices as well. Once potatoes are cooked, drain from the water and season them generously with salt, pepper, and garlic powder. Then wedge the potatoes in between the chops and underneath. They will get flavor from the lambs fat once it’s cooking in the oven. Add the rosemary and wedge in between everything as well. Pop it in the oven to bake for 10-12 minutes. Take out and allow the meat to rest for at least 5 minutes before digging in. Enjoy! Salam, beautiful. I love watching and reading your posts. It’s probably a typo but it’s sprigs of rosemary not springs. yes! total typo, thank you for catching that!